Ooops. Will a lemon ripen after it's detached from the tree? I have no experience with lemons. Did you try Googling it? Oh! I wonder if it will continue to ripen? I hope so!! Fingers crossed for your lemon! as i remember, when i had a lemon tree and let mine turn yellow, they were rotten. maybe eat it sooner than later? Oh no ... what happened ? It just fell off ? That might be a sign that its ripe ... hmm ... what are u going to do ? Hi Mama Pea :) I did Google it, and there are mixed suggestions. 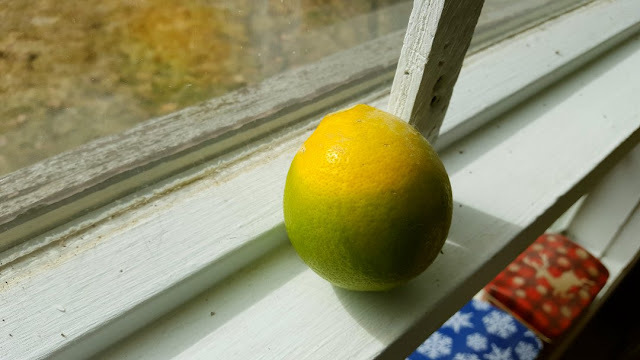 Many people will say the lemon will continue to ripen in a sunny window, so that's where I've left it just to see! It took nearly a year to start turning yellow...who knows how long this will take! Thanks Dianna! I'm not giving up on my little lemon! It's my first "born" lol! Really Joyce? Gosh I hope this yellow one doesn't turn out rotten! I have so many little green ones growing! Hey Nik, I just woke up this morning and it was on the shelf like that. I don't know if it was feline-encouraged or if it just fell off. I wrote to the company that sells them (at least the one on the tag when I bought it) and asked for their advice. I'll update as soon as I hear from them! I can't recall what happens if they fall from the tree partially green. I'm usually wanting lemon pie, so I'm usually too impatient to wait, LOL. Check it every day for soft spots (I remember that sometimes happens.) Mine has just bloomed and has teeny tiny lemons on it, so it will be a long while before I get another pie. Thanks Leigh, could I possibly use my one lemon for some kind of micro lemon pie??? lol...I'll have to keep an eye on it, I should be hearing back from the company that sells them though, hope they have some good advice too! I read that it takes Meyer lemons sometimes up to 9 months to turn yellow, and that was the case with mine! After it ripens, it will become a lemon square. Rain, I would leave it in the window and keep and eye on it. If it starts to go brown or develop soft spots, I would just go ahead and harvest the juice. Rats. I was hopeful it would make it to the end. Hi TB! :) Yeah, I was hoping too! But I think it should be good still! It's a sunny day so I want to see if there is any progress by tonight. If it won't ripen on it's own, I'd freeze whatever lemon zest I could, and use the juice (if you can).